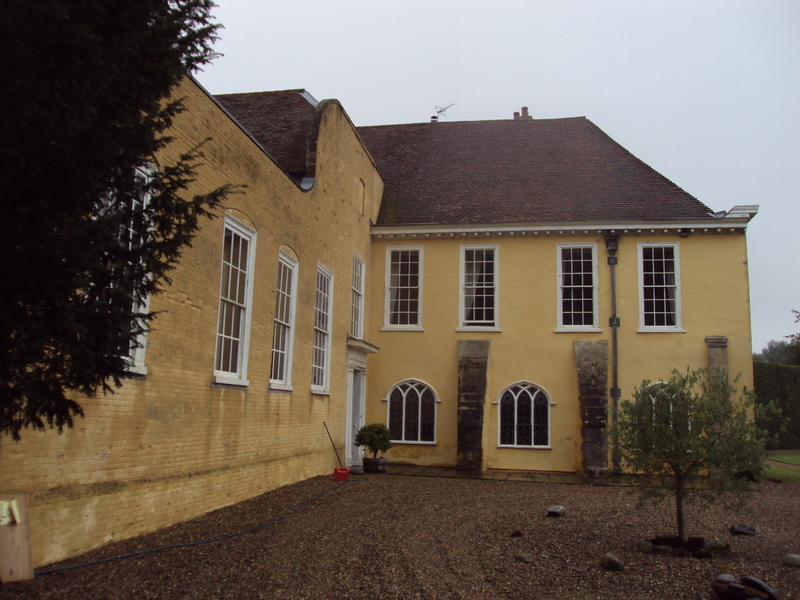 St Mary’s Priory of Augustinian Canons at Ixworth is one of the least well known of all Suffolk’s monastic houses, on account of the fact that the Priory buildings were turned into a private house after the dissolution and have remained in private hands ever since. 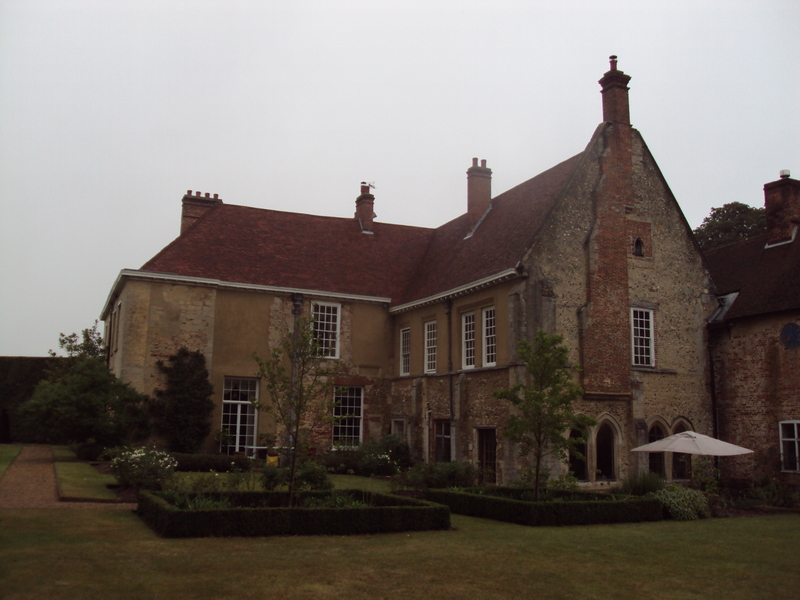 Ixworth Priory was one of only a handful of religious houses within the Liberty of St Edmund (West Suffolk), an area tightly controlled by the Benedictine Abbots of Bury St Edmunds, who were most reluctant to permit the intrusion of other religious. However, the foundation date of the Priory (1100) gives a clue as to how the foundation may have come about. Abbot Baldwin of St Edmunds died in 1097 and the abbacy remained vacant for three years while the Norman barons did their best to obtain control of the Abbey. Hugh d’Avranches, Earl of Chester, managed to obtain the appointment of his illegitimate son Robert (who was barely old enough to be eligible), but Robert was deposed two years later by St Anselm of Canterbury. It was during this period of particular weakness for the great Abbey that Gilbert le Blond (ancestor of the Blount family) managed to found a priory of Augustinian canons at nearby Ixworth. Yesterday I was fortunate enough to be able to see what remains of Ixworth Priory, which was incorporated into the post-Reformation house today called Ixworth Abbey. The remains consist of the west range and part of the Prior’s lodging. The west range stood to the south of the Priory church at right angles to it; in the middle of the west range, oriented east-west like the church, was the Prior’s lodging. 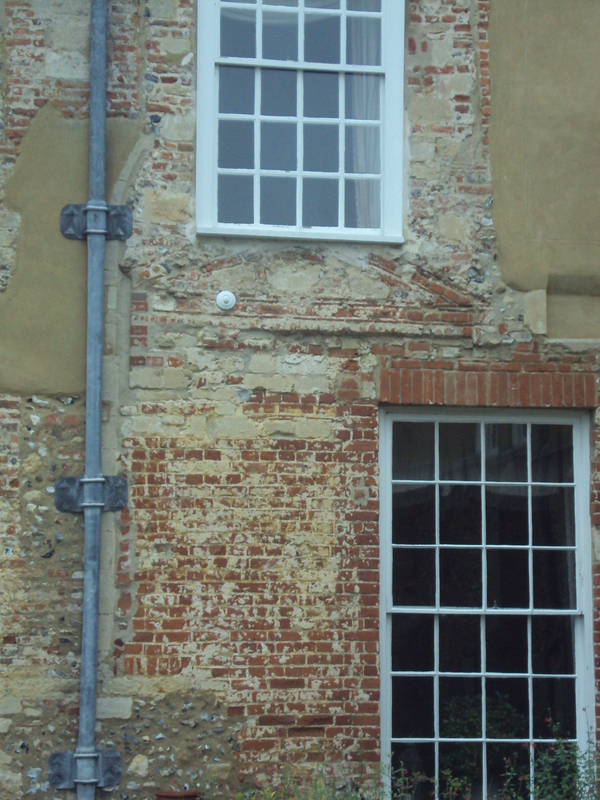 The remainder of the house was added in the seventeenth century and was given its present appearance in the eighteenth. 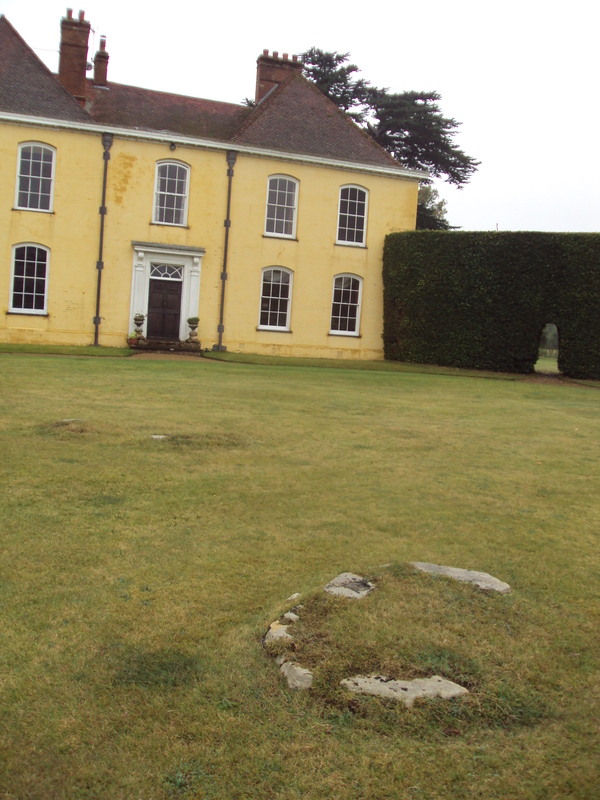 On the north lawn are what appear to be the remains of the Priory church, in the form of large octagonal bases for piers (one of which is now decorated with a sundial on a pedestal), and a number of medieval tomb slabs. 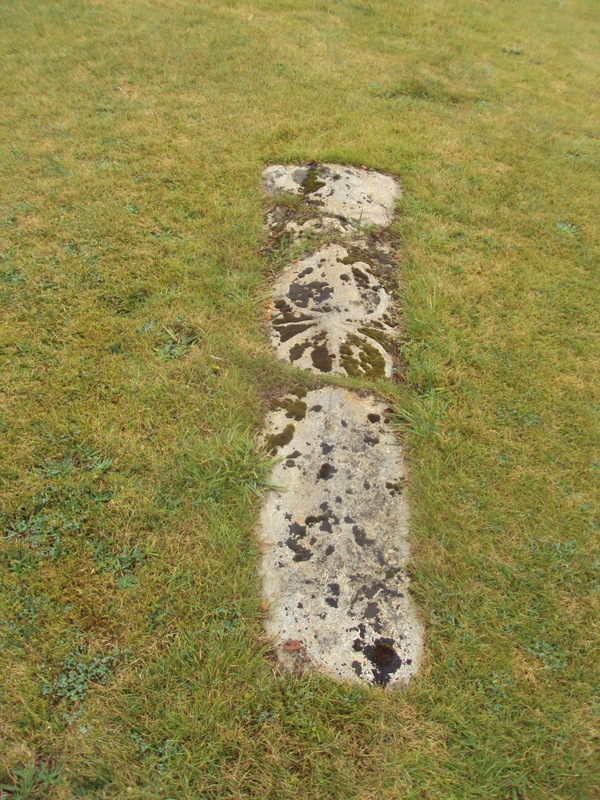 Just beyond the tomb slabs the north lawn drops away to a cricket ground, with the edge of the lawn being marked out with pieces of reused stonework from the Priory. 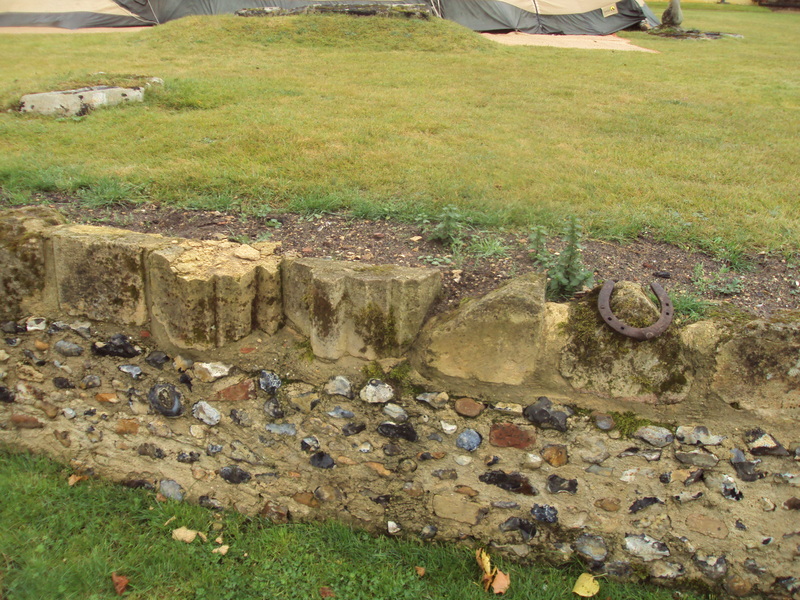 Began trenching the paddock on the north front of-the Abbey beyond the sunk fence, filling up the pike pond with the rubbish, &c. Found massive foundations of flint walls ; some of the angles in small blocks of freestone. They were in various directions, some interior partitions, but not always at right angles with the principal walls. The interior was generally floored with a layer of chalk stone, on a thick bed of coarse mortar. From the lump of foundation left at the west end, a wall extended in a northerly direction about 25 yards, when another wall went westerly at right angles, and an interior wall was found parallel; the eastern side of the interior wall was divided by similar constructions of about nine inches thick into small apartments, but no evidences of doors were visible, though a regular line of chalk stone flooring on a thick layer of coarse mortar was evident, on which the party walls had been erected. About ten yards from the east and west principal wall, and also about the same distance from the west end buttress, we came to a foundation of 3 rectangular sides with buttresses projecting from the angles, with an area of about 13 feet. At the foot of the second buttress, east of the first one, below the level of the foundation, was an excavation about 2 feet deep, and about 4 feet diameter, apparently a fireplace for a furnace, the sides sloping inwardly and cemented all round. On the bottom, which was not cemented, were built two oblong parallel lumps of stones and mortar about a foot high, and covered with cement, apparently intended to receive the bottom of the cauldron for melting lead, as there were remnants of lead and solder all about; and not far off, but deeper down in the soil a foot or more, were found the two ‘pigs’ of lead. By 1849 these pigs of lead were in front of the main entrance of the house (presumably on the north side) and were marked with the crowned monogram of Henry VIII. This is clear evidence of the systematic stripping of lead from the roofs of monastic buildings immediately after the dissolution. Sir Thomas Kytson the elder (d. 1540), the builder of Hengrave Hall between 1525 and 1538, is supposed to have purchased both lead and stone from the site of Ixworth Abbey for his new house. The earthen mound [in front of the house] is raised over a brick grave, made capable of containing two bodies, but there was only one in it—a female skeleton … which had been buried in a coffin; as was evident by a black mark, as if drawn with charcoal, the exact shape and size of one; and which was the only evidence, with the addition of a few splinters of oak adhering to the handles and nails, which were lying in their exact positions, and which were removed to the Abbey, but the skeleton was left untouched. It was on the left hand or north side, and not in the centre. On the outside, to the north of the wall of the grave, and about two feet under the surface, we came to a quantity of lead, which proved to be the winding sheet to a body, which was also pronounced to be a female. The skeleton appeared perfect, with unctuous matter about it, but no hair on the scalp. The leaden wrapper and its contents were deposited in the vacant space on the right hand of the skeleton. The dos d’ âne grave stones were not found in their present positions, nor indeed in any, but used as building materials in the old flint wall, which it was necessary to remove to accomplish the object we had in view, of diminishing the damp of the house by draining the water from it. The pieces were preserved and placed over collections of bones as at present, of which there are great quantities under ground, which from the confused heaps in which they were found, had probably been moved before. This passage is useful because it tells us that the medieval tomb slabs visible today are not in their original positions – and therefore that nothing about the layout of the church can be deduced from them. Having for a short time walked through the beautiful grounds of Mr. Cartwright, where are some remains of bases of pillars of the Priory chapel, and several richly florated crosses on stone coffin lids rising above the lawn, the company entered the house, in the hall of which, formerly the crypt of the Prior’s hall, the exhibition of the Society had been arranged. This crypt is extremely interesting. Mr. Adey Repton remarks :— “The capitals on the walls being partly Norman and partly early English, appear to me to be of the time of King John, or about the year 1200. The same may be observed on the bosses, which remind me of the works of Bishop Joscelins in ‘Wells Cathedral’.” Here is admirably preserved in an oaken table, the stone coffin lid of Prior Poyk, the 12th Prior, and a stone coffin. 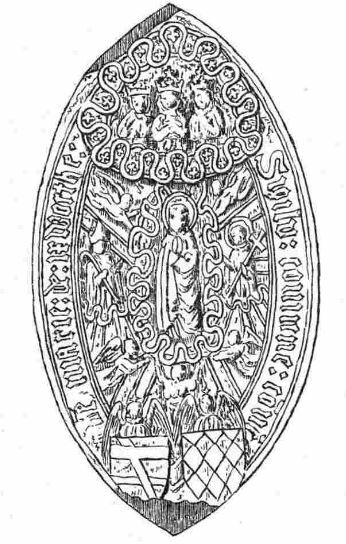 One of the objects displayed for the members of the Society on this occasion was a copy of the common seal of the Priory of St Mary of Ixworth, taken from the one appended to the deed of surrender, which depicted the Assumption of the Virgin and showed the arms of Gilbert le Blond (barry nebulée of six), the founder of the monastery, at the bottom right. The next archaeological investigation of the Priory had to wait until 1957, when archaeologists concluded that ‘a large part of the canons’ dormitory over a vaulted under-croft, and the eastern half of the refectory are included’ in the surviving buildings. They remarked upon ‘the open 13th century arcade at the southern end of the dorter subvault’ and reported that ‘remains of three of the bases of the central tower—of 13th century date—bases of the choir arcades and a single base of the N. aisle of the nave’ had been discovered. Ixworth Abbey is one of Suffolk’s undiscovered treasures, and my main regret from my visit is that I did not actually manage to get inside the building. Nevertheless, I was pleased that so much is visible from the outside. Thank you for this beautiful and detailed account. I have, today, found out that Gilbert le Blount is a direct ancestor of mine and this was so enriching to read. I am wondering, however, where the link on the Blount name was supposed to go (it lists now as expired). 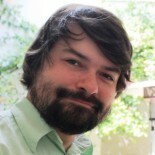 This entry was posted on September 18, 2016 by jacobite.